← Bolivia Has World’s Largest Informal Economy … that is we do not trust demagogue populist govs! 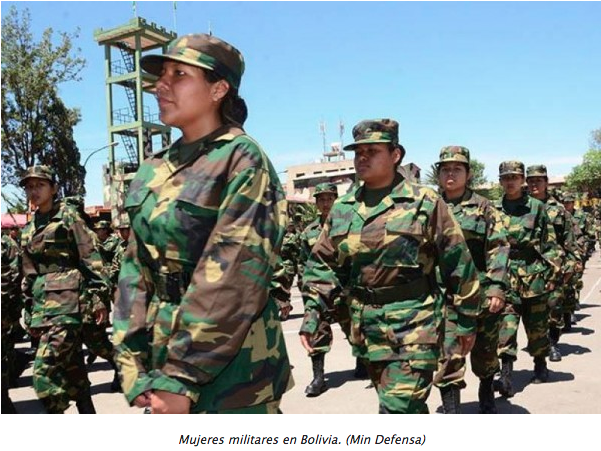 Bolivian Thoughts opinion: There are mixed feelings about mandatory military service in Bolivia: there were many examples where soldiers were told to do family chores for the officers’ families and simply serve as unpaid workers. And there are also positive things like what my father told me when I was a kid, he said that for him was a very good experience, as it was the melting pot where Bolivians met and shared their lives, traditions. People from the highlands went to the lowlands and vice versa, poor, rich, white, mestizo, indigenous young men gathered together; university students, miners, farmers, blue and collar workers were together. Only over the last 40 years that the “well-to-do” started buying their military service card. Paying or pulling strings not to go … and that destroyed the sense of the melting pot for Bolivia. Now, this voluntary service for women is an interesting concept, and I cannot avoid thinking of those israeli women who do military service and I like the concept. Hopefully, these young Bolivians would do real public service and not be treated badly, following the old Prussian-school that shaped the Bolivian Army. The Military General Director of the Armed Forces, Ramiro Mojica, announced on Tuesday the beginning of the recruitment for military service, for the first time for women and begins on Thursday, February 1 in ten recruitment centers. “We call all young people between 18 and 22 years of age, particularly boys, to be presented in a mandatory way and ladies so that they can also present themselves and perform military service voluntarily, with one year of permanence in all the army barracks of the national territory, indicated Mojica. In 2018, 10 recruiting centers were opened for the first time, which will receive women and these are: Battalion School of Communications I Vidaurre of La Paz, Logistic Battalion I The Heroic Rabonas of the Pacific of Oruro, the Engineering Battalion V Ovando de Sucre, the Regiment and Ecological School for the Protection of Parks Cacique Juan Maraza in the community of Ichoa in the TIPNIS, the Infantry Regiment III Pérez de Potosí, the Artillery and Antiaircraft Defense Group (GADA) 92 in Cochabamba; the GADA 93 of Santa Cruz, the GADA 94 of Tarija; the Marine Infantry Battalion (BIM) II Tocopilla of Trinidad and the BIM VII Porvenir de Cobija. The requirements to enlist are the current identity card with two photocopies, the original birth certificate with two photocopies, and for those who are 17 years old, a declaration of free will to present themselves, with the parents’ consent and of knowing military service duties. This entry was posted in Bolivia and tagged competitiveness, military service. Bookmark the permalink.